My husband and I just had our honeymoon in bearadise and it was fantastic, secluded and quiet. We noticed the first night that the headboard on the bed leaned and they sent someone within the hour to fix it. We could not be happier with our stay and plan to return for our anniversary trip. We love this cabin. This is our 2nd stay in Bearadise. We noticed that the porch is beginning to settle, and causes a noticeable slope. From the driveway, walking towards the entry door, you can see the slope. I doubt it's in danger of crashing right away, but it'll need some attention at some point. Everything was great and it was even decorated beautifully for Christmas. The only thing with this cabin was no wifi, no landline, and no cell service. We had to go down mountain to get a signal. Also, the propane grill was not working so we had to improvise to grill out. All in all it was a nice, quiet, and relaxing stay. Great place to go to disconnect. No wifi limited cell service. When you need a weekend to be out of touch this is the place to go. Our grill didn’t work. The house was nice, but you can tell it is old. The driveway was difficult to get in with a truck. My husband & I had a wonderful visit at Bearadise. Always a great & relaxing time . Looking forward to our next visit. Each time we come back , there is less of a view from cabin porch due to all the kudzu talking over the beautiful trees. Would like to see work done to restore that beautiful view. I loved the unit. I just didn’t like the bed. The head of the bed was torn up. The unit was very clean. Really bad dip at the bottom of the driveway. Checking in was easy and quick. This cabin is in a great location. It is well maintained and clean. Not a crazy drive. The only complaint I have is that there is NO WIFI. I should have known this, since it is not listed in the amenities. I had read on a previous review that wifi service was spotty, but this cabin has no router to even attempt to connect a network. It wouldn't have bothered me except I left my 2 year old with my parents. I had no service from Verizon at the cabin and no WiFi, so I had no way of contacting my parents back home. Also, the landline phone did not work in the cabin. It's a great cabin if you're looking to get away from it all. The cabin was just as nice as expected. There are a few minor things needing attention but not affecting our stay. The Driveway was a little challenging at first but fine after a couple times. If you must have internet service, this is not the place for you. I used the express checkout which apparently works fine but I would have thought a confirmation text or e-mail would have followed. I then called the Office to confirm checkout and was on hold several minutes at which time I left a message and went home! Overall, we were very happy with our stay and would recommend both Cabins USA and the cabin Bearadise to anyone for a nice secluded Smokey Mountain stay. Cabins was very nice and clean. Driveway was very steep and the water had a very bad odor when in use. We enjoyed our stay. It was so quiet and peaceful there so we spent a lot of time on the deck relaxing, rain or shine. We loved this cabin! Very clean and hot tub was great. Perfect location not far from the main strip. I really liked that there wasn’t cabins right next door so you get that secluded feeling. The cabin was so nice and cozy. It’s definitely a steep hill to drive up, but it’s very nice and secluded. We could still see some cabins around us, but no privacy or noise issues. The cabin was clean. We got a new sofa the day we arrived so it was very nice, but the chair could use replacing next. The hot tub was nice and clean. You’re provided plenty of towels and toilet paper/paper towels for a week or long weekend. The bed was comfortable. The pool table was so nice to have. It was also really nice to be so close to Parkway. The grounds could use a little maintenance (there was some litter around the cabin, as well as some articles of clothing that look liked they were flung over the edge of the balcony for hot tub time haha). The customer service was great, everyone was really friendly. We would definitely recommend this cabin and would go again! Absolutely loved this cabin, very cozy and nice view. Great location, just 2 miles from town yet far enough to feel seclusion as well. We will never choose another company to go through Cabins USA is #1 in our books. Only one small detail is to watch out pulling out of driveway to your right, very large hole that can’t be noticed until it’s too late. We had a fantastic time. The hot tub on the deck was incredible, we almost didn’t get out the entire weekend. The best Christmas ever. And the seclusion of Bearadise was huge plus. A few, very minor issues. No WiFi as promised and of course, being the holiday the office was closed, even though, we were told a person was on call, we were not able to connect. After four or five attempts we just gave up and enjoyed the rest of the weekend without Wi-Fi. And there were numerous burned out light bulbs, in the kitchen, master bathroom, wall sconce on the stairway. I know this is such a nitpick thing, but it is such a gorgeous cabin you want your guests to be able to enjoy all of its splendor. Oh, and watch out making that right hand turn out of the driveway, that’s a major bottom scraping ,tire buster hole. . Spectacular views, seclusion, relaxing hot tub, and a beautiful interior, all in all a most excellent Christmas day vacation! We are already planning our Valentines day stay. Liked the cabin and the stay. You (badly) need new couch and chairs. Some light bulbs were out. Great other wise. We will be back. The location of this cabin was great, less than 2 miles from stop light #10 in Pigeon Forge. We had no trouble with traffic on our drive. Everything inside cabin was clean, the outside there was some trash from previous guest on the backside of cabin, also the bed frame looks to of been connected to the wall at one time but now it almost leans in. Other than that, everything else was in working condition and very relaxing! All TV's worked, turned on the fireplace one night, and also used the hot tub & pool table. Will recommend this cabin to others in future! We definitely will be using Cabins USA the next time we stay in Pigeon Forge!!! Overall our stay was wonderful & we enjoyed our time in Mtns. Bearadise one of our favorite places to stay. Had trouble w/ Express Check-In & Check-Out this time. Difficulty getting thru & then told documents did not go through. Express check in process had been completed months before. Representative wanted me to go thru process again. Received our door code for check-in same day. The cabin wasn't bad.....just not many dishes in the kitchen that you need to make meals... The bed was one of the most uncomfortable beds I have ever slept on. Literally I have laid on bricks more comfortable so spending 3 nights on that bed definitely wasn't fun! I did however like the location it was out of the way of the insanity of town! Overall if pigeon forge is your thing I'd recommend the cabin if they get a new bed in there! We really enjoyed the cabin!!!! So glad we found it, we will be back! I am so happy to hear that you enjoyed your stay in Bearadise! When you are ready to stay with us again, please mention you are a return guest for an additional discount. Thank you again for your review and thank you for choosing Cabins USA! Little shocking to see the cleaning people still there at 4:15. They were running late so they said. The toilet water was very stinky. Dishwasher had a burnt smell due to plastic fan laying on the heating element. Assume the cleaning crew should have checked this. Also, for the price there should have been shampoo in the bathroom. For the price, the cabin was not terrible. The water smelled rancid (being from the country we assumed well water). There was mold on the ceiling in the living room. The couch cushions were torn. Other than that, the overall experience was fantastic. The check in and check out process was very simple. The cabin was very nice and secluded. It was perfect for a get-a-way! The only couple things that could be improved on was there were no grilling utensils, and the hot tub didn't seem very clean. This is the second year we have rented this property and greatly enjoyed our stay. We would definitely stay here again! The only issue we saw wrong with the property were some of the window blinds did not function correctly and the one near the hot tub was missing entirely. Thank you for taking the time to let us know about your recent stay in Bearadise! We here at Cabins USA strive to give each guest the same great stay you enjoyed while vacationing in the Smokies. Thank you for letting us know about the blinds and hot tub. Your comments have been forwarded to our maintenance department to be addressed. When you are ready to stay with us again, please mention you are a return guest for an additional discount. Thank you again for choosing Cabins USA and we look forward to seeing you again soon! Perfect cabin for a couple to get away from it all. Very secluded, yet only about 2 miles from the Pigeon Forge Parkway. We stayed in Bearadise for 3 nights. The second evening, when we returned for the night, the air conditioning was not working. I called Cabins USA, and within an hour, there was an HVAC tech there working on the problem. By bedtime, the cabin was nice and cool. Both the service dispatcher and the tech were very nice and quick to respond. Perfect response! Also, Bearadise was the cleanest cabin we had ever stayed in. It was our first time staying with Cabins USA, and we DEFINITELY will again, and will recommend them to our friends!! Had such a great time. Cabin USA is a Great place to start your vaction with. Our trips to the Smoky MTNS (>10 yrs) are always wonderful & Bearadise is one of our favorite places to stay. Plan to return again in Fall. Love the Express check in & check out! Would love to see better Kudzu vine control. See more destruction each time we come. Thank you for taking the time to let us know about your recent stay in Bearadise! We here at Cabins USA work hard to make sure each of our guests have the best stay possible while vacationing in the Smokies. When you are ready to stay with us again, please mention you are a return guest for an additional discount. Thank you for choosing Cabins USA and we look forward to seeing you in the fall! Our stay was overall good, HOWEVER, we had an issue with the ladies in the office on the last day of our stay. I received a phone call months before we checked in and was told that there would be no cable or wifi. Being that I was going to be on my honeymoon, this was okay with my husband and me. Friday morning, the day before we checked out, a man showed up at 8am, without notice, to work on the cable. My husband and I were asleep and were rather startled, being that no one had told us when we checked in that there was going to be anyone coming by. 15 minutes after the cable guy showed up, I got a phone call from the cabins usa office trying to tell me that the cable guy was going to fix the cable so that we had it for our stay.... I tried to explain that this was not necessary as we were going to be leaving the following day, but was told to just call when we were leaving the cabin for the day so that he could return to actually fix it. Frankly, I did not like the idea of a stranger being in the cabin with our belongings while we were not there, and I don't think that was our responsibility as renters anyway. But, nonetheless, I called anyway once my husband and I left. At this point, I was annoyed, but not angry. When I called though, the woman I spoke to on the phone was rather rude. I explained to her what had ensued that morning, and rather than being apologetic, she told me someone had tried to contact me and couldnt get in touch with me. When I asked her when this attempt was made, she said it had been that morning... which I had indeed answered that phone call, but the cable guy WAS ALREADY THERE. When I pointed this out, she still did not apologize, but was rather rude to me for the remainder of the conversation. I had very little issues with the cabin. In fact, the only issue we had was that the drain in the master bath was not working from the first day we got there until we left, so we showered upstairs. My main concern was how I was treated through out the "cable" issue. Beautiful nothing was wrong except the tvs did not work and a few small repairs but it was fresh, new and secluded. Thank you for taking the time to let us know about your recent stay in Bearadise! We here at Cabins USA work hard to make sure each of our guests have the same great stay you enjoyed while vacationing in the Smokies. I apologize for the issues you experienced with the televisions. Your comments have been forwarded to our maintenance department to be addressed. When you are ready to stay with us again, please mention you are a return guest for an additional discount. Thank you again for your review and thank you for choosing Cabins USA! We enjoyed the Bearadise cabin being very comfortable, privacy to adjacent cabins, wonderful pool room and Jacuzzi. I am so happy to hear you enjoyed your stay in Bearadise! We here at Cabins USA work hard to make sure each of our guests have the best stay possible while vacationing in the Smokies. When you are ready to stay with us again, please mention you are a return guest for an additional discount. Thank you again for your review and thank you for choosing Cabins USA! We loved our stay especially with it being the first cabin we have stayed in. The only suggestion we had is maybe cutting some of the trees for a better view of the mountains but the trees in front of the hot tub gave plenty of privacy and only the tv on the living room worked but of course we were not there to watch tv. We would absolutely recommend this cabin it felt like home and would definitely stay again and it was the easiest check out process. Thank you for taking the time to let us know about your recent stay in Bearadise! We here at Cabins USA work hard to make sure each of our guests have the same great stay you enjoyed while vacationing in the Smokies. When you are ready to stay with us again, please mention you are a return guest for an additional discount. Thank you for choosing Cabins USA and we look forward to having you as our guest again! I was very happy with our cabin. Loved the location close to town but still felt secluded. I would recommend this cabin for a couple that wants privacy with easy access to the downtown attractions. We were very happy with the kitchen as well and cooked breakfast in every morning as well as most dinners at night. I will defiantly try to reserve this cabin for future visits! i would recommend getting wifi though. I am so happy to hear that you enjoyed your stay in Bearadise! We here at Cabins USA work hard to make sure each of our guests have the same great stay you enjoyed while vacationing in the Smokies. Thank you for your suggestion of WiFi. Your comments have been forwarded to our Owner Liaisons who will bring this to the owner's attention. Thank you for choosing Cabins USA and we look forward to having you as our guest again! Thank you for all of your kind words! We here at Cabins USA work hard to make sure each of our guests have the same great stay you enjoyed while vacationing in the Smokies. I apologize for the issues you experienced with the televisions. Your comments have been forwarded to our maintenance department to be addressed. Thank you for choosing Cabins USA and we look forward to seeing you again next month! The stay was great. The cabin was clean, tidy and well kept. While there were televisions in the guest bedroom and game room, the cable did not work. Maintenance came out promptly but due to the holiday was unable to replace the mixing boxes. As this was a retreat, we made do without It and still have a wonderful stay! Thank you for taking the time to let us know about your recent stay in Bearadise! We here at Cabins USA work hard to make sure each of our guests have the best stay possible when visiting the Smokies. I apologize for the issues you experienced with the cable. Maintenance is working to correct that. When you are ready to stay with us again, please mention you are a return guest for an additional discount. Thank you for choosing Cabins USA and we look forward to having you as our guest again! The location of the cabin was great & so was the cabin itself. But trying to get to the cabin was the difficult part, there was no address when we were given directions. So we had to go on a search which by the way there are other cabins that look the same. So as we thought we arrived to the cabin, it actually wasn't our cabin & the door was left unlocked as we walked in we noticed that the cabins have the name on the outside so this is actually how we found our cabin after 15 minutes of driving into different cabin driveways trying to figure this out. Which wasn't on the paperwork either. We even tried calling the number for you guys & no one awnsered the phone 8 times! This is confusing and an actual address should be given to guest to make this easier. Also customer service should be able to pick up a phone call just in case guests are lost which is very easy to do in a town that you aren't familiar with. Anyways, after that we were happy to start our vacation. We try turning on the television after a day of exploring & none of the televisions are working & unplugged & 'not set? I don't understand why there are three televisions in the house if they aren't set up & I wasn't going to to let me husband do the work for you guys. Anyways we were there to vacation not watch tv. But it would of been nice to watch tv while cooking. We did receive a voicemail, but unfortunately when you guys called we were out in the smokey mountains & we were not going to call you when we got home really late & we wanted to be present in the cabin if someone was to go out because of our belongings. We were also told a grill was there. The grill was disappointing..... there also wasn't charcoal for it. Overall the cabin was great. But directions & the televisions working would of made our stay a lot better. We aren't the type to complain about things because we rather enjoy our vacation so this is why you didn't hear from us. The cabin was beautiful and we enjoyed the peaceful time alone to celebrate our 25th anniversary. I have stayed with Cabins USA multiple times over the years and I have never been disappointed. Bearadise was a perfect cabin for two and a weekend away. The drive is really close to stop light 10 and the cabin was very comfortable. The DISH satellite and TV in the bedroom did not work but that was something minor. Loved the place. I have already booked with Cabins USA for a December trip. The staff is amazing and very helpful with any questions or concerns. I will continue to use Cabins USA for all my trips to Tennessee. Thank you for continually choosing Cabins USA when you visit the Smokies! We work hard to make sure each of our gusts have the same great stay you enjoy. Thank you again for your kind review and we look forward to seeing you again soon! I stayed at beardise on july15 for a week. The cabin was very clean, comfortable and quiet. Enjoy our time there. Will tell my friends. Liked the easy way to paid so little down to hold our reservations. The roads to the cabin was very narrow so be careful... the television needs to be worked on. And some trees need to be cut down for a nice view. If I return to Tennessee, I will stay at cabins usa. Everything was fantastic about the cabin. Homey, good location that was close to Pigeon Forge, etc. My biggest complaint about it, however, is that there were tons and tons of dead ants upstairs. On the pool table, on the shelving, on the balcony to go down the stairs, etc. There were also little white pebbles, which, I'm assuming is ant poison surrounding the dead ants. I realize the need to get rid of unwanted visitors from the cabin, but cleaning staff should have cleaned it before we arrived. If there were children staying with us, I would have had a much bigger issue. Also, a few more towels would have been nice! With only two per bathroom, we continuously had to wash and rewash the four we had. Other than that, we had a fantastic time! The fully equipped kitchen was a huge plus and everything else was phenomenal. Really enjoyed our stay and we plan to use Cabins USA again. 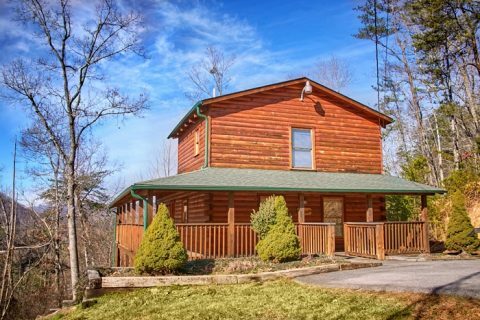 Beautiful cabin in a secluded location yet only a couple miles from Pigeon Forge. It was the perfect choice for us! Thank you for all of your kind words! When you are ready to stay with us again, please mention you are a return guest for an additional discount. Thank you again for your review and we look forward to having you as our guest again! This is the first time we have booked with cabins USA and it was great. Cabin location was good, cabin itself was clean and the staff at check in were great. The property itself had trash all around it that hadnt been cleaned up and the upstairs and bedroom tv's did not work. All in all we will book with cabins usa again. Thank you for taking the time to let us know about your recent stay in Bearadise! We here at Cabins USA work hard to make sure each of our guests have the best stay possible while vacationing in the Smokies. Thank you for letting us know about the televisions. Maintenance has been notified and will be correcting that issue. When you are ready to stay with us again, please mention you are a return guest for an additional discount. Thank you for choosing Cabins USA and we look forward to having you as our guest again! I have a suggestion for finding the cabins easier for future guests. On the sign at the end of the driveway you should also put the name of the cabin, or maybe a number. We had to drive up a couple of driveways before we found ours. Also, other guests were looking for their cabin one night and ended up in our driveway by mistake due to not knowing which cabin they were at. But we LOVED our stay and would do it again! Thank you! Thank you so much for your suggestion. We are continually looking for ways to improve our guests' stay. Your comments have been forwarded to our Owner Liaisons who will be bringing this to the owner's attention. Thank you for choosing Cabins USA and we look forward to having you as our guest again! Other than that we really enjoyed our visit there. Thank you for a taking the time to let us know about your recent stay in Bearadise! We here at Cabins USA work hard to make sure that each of our guests have the same great stay you enjoyed while vacationing in the Smokies. I apologize for the issues you experienced with the television. Your comments have been forwarded to our maintenance department and they will be correcting that issue. When you are ready to stay with us again, please mention you are a return guest for an additional discount. Thank you again for your review and thank you for choosing Cabins USA! It was amazing, the only negatives were no WiFi, amd the tv bedroom did not work but that was not a huge deal. Def ready to come back again! Absolutely loved using CabinsUSA and staying at Bearadise. Ashley in the office was awesome and I thank you for all of your work to make our stay just perfect! Thank you for all of your kind words! Our associates truly appreciate being recognized for the excellent customer service they provide to each of our guests. When you are ready to stay with us again, please mention you are a return guest for an additional discount. Thank you again for your review and we look forward to having you as our guest again soon! I was looking for a clean cabin with one bedroom on the main level. I was having back problems so as few stairs/steps as possible with comfortable seating was my main goal, and that's what I got. In looking for those things I failed to notice there was no Wi-Fi. We were away from home for several weeks so Wi-Fi to get online and pay our bills was important. Also, the washer and dryer were very small. We liked the big bathroom, but it only had one small rod to hang towels to dry. When we first tried to turn on the tv in the living room and the tv in the bedroom they would not come on, there were 10 remotes total, really! After trying for quite awhile I called the office. The lady was very nice and said she would send over the maintenance man, but it would be awhile because he had several stops before us. He did come several hours later and had to rewire the tv in the living room, someone had unhooked it to play games on it and he said the tv in the bedroom would was not hooked to the dish, it would only play dvds. He also, lit the pilot on the fireplace because it was out. We later noticed there were two bulbs out over the bar and three out in the fixture over the table. There was only one dish towel and no dish cloths. I would have thought the cleaning people would check those things. Over all I thought the amenities were bare minimum. Thank you so much for making it an easy process!! I am so happy to hear you enjoyed your stay in Bearadise! When you are ready to stay with us again, please mention you are a return guest for an additional discount. Thank you for choosing Cabins USA and we look forward to seeing you again soon! Very clean and roomy with a nice view . Hot tub,wrap around deck,nice furniture, large kitchen,pool table and did i mention very clean! Built on a side of a hill with a steep driveway which didnt bother me but might bother some people . The cons,no wifi and tv upstairs wasnt working as far as the Dish was concerned . But thats a minor thing since we were on vacation and didnt need to be online . Cabin was extremely nice and would rent cabin again ! Thank you for all of your kind words! Our cleaners work hard to make sure that each of our cabins are thoroughly cleaned and fully stocked so all our guests have to do is walk into their cabin and start relaxing. When you are ready to stay with us again, please let our reservationists know you are a return guest for an additional discount. Thank you again for your review and we look forward to seeing you again soon! My wife and I stayed at Bearadise Sept. 18-20. Overall, I would recommend this property and would stay again. Just a few issues that need to be addressed, more with the property owner than with Cabins USA. The TV's in the cabin were recently upgraded which was nice (the old tube TV was outside for trash collection), however when we arrived, two of the three TV's did not work... in the master BR and upstairs game room. It would have been nice to watch college football while playing a game of pool, but at least we had one operational TV. Cabins USA did send a technician on Friday and Saturday to get the other two TV's working, however they were unable to do so, and the satellite company would not send their tech out on the weekend. I read several other complaints about the pool cue sticks and thought to myself, how bad could they really be? They are bad! Tips have been broke off which renders them almost useless. Owner needs to make a small investment in new sticks. The only other complaint would be the carpet in the master bedroom. It really needs to be replaced. Very dirty with stains.. not a good impression. Again, overall our stay was great. Cabin was secluded, in a nice location relative to area attractions, and Cabins USA did attempt multiple times to fix our satellite service. Just wish the owner would resolve a few small issues. If you are paying for the amenities, they should be operational. no cable in bedroom , called them monday no one showed up .. only gave us 2 towels . bearly in plates or cups. Rented this cabin in August of 2015. It was clean, spacious, cozy and comfortable. If you are looking for a mountain view, this is not the one. However, it is a very quiet and secluded place to stay. My only two complaints are that they should have instructions on how to work the satellite TV and the fireplace as there was no remote so we could not get it started. We would stay at this cabin again!! Thank you for taking the time to let us know about your recent stay in Bearadise! Unfortunately, our fireplaces are only turned on October-May. When you are ready to stay with us again, please let our reservationists know you are a return guest for an additional discount. They would also be more than happy to help you find a cabin with a view, if you would like to try another cabin! Thank you again for your review and we look forward to having you as our guest again! Very nice place! TV's have been recently updated, cabin was very well kept. Only complaints were hot tub light didn't work, and pool sticks were all damaged. Others than that, this place is great! Will probably come back to this location and will definitely recommend to others! Thank you for all of your kind words! We work hard to make sure that each of our guests have the same great experience you did while vacationing in the Smokies. Thank you for letting us know about the hot tub light and pool sticks. That has been forwarded on to our maintenance department so they can be corrected. Thank you again for your review and we look forward to having you as our guest again! Our stays at Bearadise have always been wonderful! We had to cut our time in July due to family emergency. Staff were wonderful & agreed to credit any future visits. Check in Docusign process had a few glitches but we were able to get it resolved before arrival date. Kitchen needed trash bags & hot tubs light was out. Everything was wonderful except the "state park" BBQ grill (we used grilling foil and that worked well) and the express check-in: information never arrived so we had to go to the office in Pigeon Forge to check in and get the door code. Other than these two minor things, everything was immaculate, comfortable and "log cabin-esque"! We would recommend this cabin to anyone and would rent it again with no reservations. Everything we needed for bathing, laundry, cooking and comfort was provided in abundance. Thank you for a fabulous, memorable stay in the Smoky Mountains. Thank you for all of your kind words! Our express check-in option is a new feature we have extended to our guests and that we are always working to improve. I apologize that it did not work correctly, but the issues have been corrected. When you are ready to make your next reservations, please let our reservationists know that you are a return guest for an additional discount. Thank you again for your review and we look forward to having you as our guest again! The cabin was great, but please get some new pool sticks! Thank you for your feedback. I apologize for the issues with the pool sticks and have forwarded your comments on to our Owner Account department and they will be working with the owner to correct that issue. I am happy to hear that you enjoyed your stay in Bearadise and we look forward to having you as our guest again! We had a great five day vacation at Bearadise. Every thing was perfect from check in to check out. This was the 12th time we have rented from USA cabins and was probably the best cabin we've got. Very easy to get to, and a very clean and enjoyable cabin. There is one thing the owner might do is update the TV's, our first day was the last day of the Masters golf tournament and I was a bit bummed with the size of the TV's. Thanks Cabins USA for another great vacation!!! Cabin was nice just had some issues like spider webs in tub area an mold around tub area. Tv's are extremely old an out dated we did not like that! Hot tub had no lights & an would not get hot! Wish the name of the cabin would have been at the bottom of the driveway. I have stayed with Cabins USA before an they were nice so will stay again but this cabin needs updating!